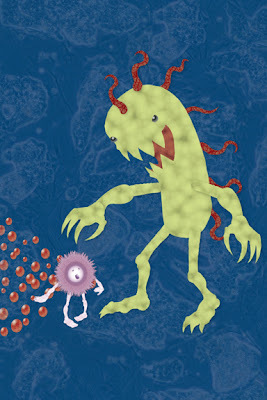 Title: Antibiotics vs. Super Bacteria. Sometimes little things are the difference between life and death. Flu Shot anyone? This is an experiment and departure from my normal style so please tell me what you think. Very nice experimental style! It's cool to change one's style every once in a while. Is this "actual" cut paper or "Photoshop" cut paper? Technology is so good, that now it's hard to tell. 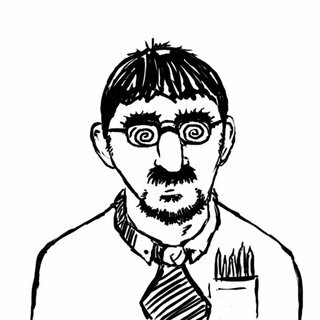 I've been accused of "photoshopping" my cross-hatching. I like the strong silhouette the paper cut makes. This made me laugh. Nice. this is good. i had the 'flu' jab 8 weeks ago and have had bronchitis ever since. flu jab-bah humbug! i love it josh! It is fun and the characters, although evildoers are adorable and fun and make them approachable! Really great! I like your experiment ;) Paper cut is so much fun! Nice strong colors too! I love the cut paper style of this piece and the monsters are wondefully designed. Thanks for being the first person to comment on my blog!! :)!!! I really like this a lot! Very strong image and very strong message, and yet it manages to be so very whimsical. Always a fan of the paper cut style! The colours, and textures add even more fun to the characters. Oh! I really like your experiment!